The ZAMBRA LA ROCÍO is a flamenco cave in the Sacromonte Granada. 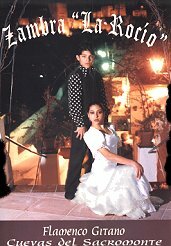 Here you will see the very best Flamenco performances. 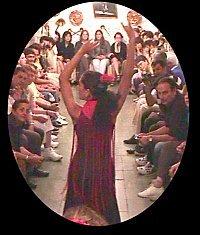 The Rocio specialises in family Zambra which means that almost all the dancers and musicians come from the same family. The members of the family start to learn flamenco from the moment they can walk or possibly even earlier. Juan Marote, one of the youngest members of the troupe, had his first television performance at the tender age of only five. 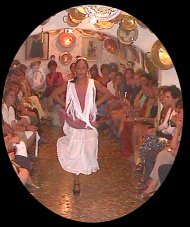 One of the advantages of the Rocio is that the musicians sit at the mouth of the cave and the dancers move up and down in front of the audience, so everyone has a front row seat and a close up view of what is going on. The Rocio has been visited by more famous names than it is possible to mention. For example, Bill Clinton and his family came last year accompanied by the Spanish king and queen. The photo on the right is a bit blurred but it is obvious that President Clinton was amused when he visited. Many of the hotels offer a package which includes picking you up from your hotel in a minibus, a guided tour of the Albayzín and Sacromonte, a free drink and a flamenco performance. President Clinton with the Spanish king being entertained by the Rocio.